The devastation of Pearl Harbor and the American victory at Midway were prelude to a greater challenge: rolling back the vast Japanese Pacific empire island by island. This masterful history encompasses the heart of the Pacific War - the period between mid-1942 and mid-1944 - when parallel Allied counteroffensives north and south of the equator washed over Japan's far-flung island empire like a "conquering tide", concluding with Japan's irreversible strategic defeat in the Marianas. It was the largest, bloodiest, most costly, most technically innovative and logistically complicated amphibious war in history, and it fostered bitter interservice rivalries, leaving wounds that even victory could not heal. Often overlooked, these are the years and fights that decided the Pacific War. Ian W. Toll's battle scenes - in the air, at sea, and in the jungles - are simply riveting. He also takes the listener into the wartime councils in Washington and Tokyo, where politics and strategy often collided, and into the struggle to mobilize wartime production, which was the secret of Allied victory. Brilliantly researched, the narrative is propelled and colored by firsthand accounts - letters, diaries, debriefings, and memoirs - that are the raw material of the telling details, shrewd judgment, and penetrating insight of this magisterial history. General - This is the first Ian W. Toll book I’ve listened to, but I will definitely listen to his others. I decided to skip over Pacific Crucible for this book simply because the content of the audio sample was more intriguing to me. Upon its completion I was so impressed with the writing that I’m listening to Pacific Crucible. Though a minor detail I do want to mention that the chapters on the device actually match the narration all the way through with only a minor glitch at one spot that corrected itself. Content - The Conquering Tide has a wealth of information and Toll somehow managed to tie it all together in a cohesive manner. This made the listening very easy. I already knew a tremendous amount about WW II, but I was astonished by some of the information I learned from this book. While the book failed to evoke much emotion it nonetheless captivated me and, at times, it held my interest to a point where I didn’t want to stop listening until I heard the outcome of the story being told. This was despite my already knowing what the outcome would be. Knowing the outcome of a battle or event is not necessarily the same as knowing how the outcome was decided through action and I would find myself not wanting to stop listening until the particular story was concluded. I found Toll’s ability in this regard very impressive. Toll provided thorough biographies of the major players and even some minor ones. He gave very good histories within the history in order to lay out settings, or locations, or cities including civilian life and how it interacted with the history. Toll managed to weave incongruent foundational information together to explain the overall history of the islands’ campaign and the naval; sea, air, and land battles that occurred. Length – I didn’t find the book too long. Actually, I was impressed by the amount of information provided in a mere 27-hours. I finished the book in 9-days, which is one of my fastest listens. Thinking about the entire book I would say it could only be shortened by four or five hours and still deliver the proper impact. In my opinion there wasn’t enough “fill” in this book to make reducing it worth the effort so I would suggest skipping any abridged version, if one is ever released. I feel the few hours you may save will not be outweighed by the content that could be lost. 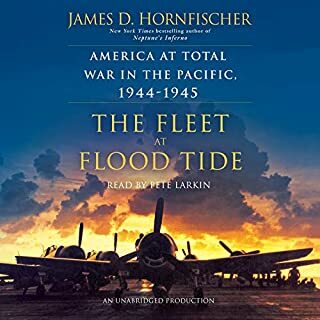 Caveat(s) – If you’re not familiar with the Pacific War I don’t recommend listening to this book out of series order because that will likely confuse you. Further, whether you’re a newcomer to the history of the Pacific War or know a lot about it I recommend adding bookmark notes about the precise island or battle being discussed at the time you stop listening. There’s so much here that you can easily get lost. The book covers two-years worth of information so managing that mentally can be tricky. There were times that I needed to repeat parts because I got lost and couldn’t remember which event was being described. My only criticism of the book is that it would have benefited from more frequent repeats of the island name or location that was being discussed, but I admit that would only be necessary for the audio version of the book. Narration – It goes without saying that narration is a huge part of any audio book and P.J. Ochlan’s performance was decent; it neither enhanced nor detracted from the story. By the second chapter I grew accustomed to his somewhat monotone style. I’m fairly neutral about the narration and the narrator. That is to say, I won’t go out looking for books he’s narrated like I do for some narrators, but I wouldn’t avoid him either. The only real annoyance I endured was his pronunciation of the islands of Tarawa, in particular that of Betio. It was particularly annoying because he says “Baht-ee-o”. I found myself talking back to my device saying “Bay-She-o”, but I’ve done the same thing for some of the best narrators too. The point being, I wouldn’t let the narration stop you from getting this book because you’ll be missing out on a great one. Don’t decline the book just because of the audio sample either, but if you absolutely hate mispronunciations (perceived or actual) or you dislike a slight monotone narration style you should get the text version. Summation - If you enjoy historical books and really enjoy useful details and background information then this book should be in your library. Toll was able to strike the proper balance of getting down from thirty thousand feet to just below treetop level without getting into the weeds. Not an easy thing to do most of the time. 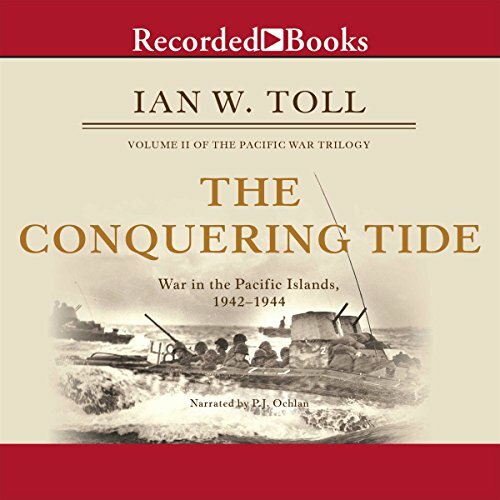 The Conquering Tide is the second book in Ian Toll's epic non-fiction series covering the entire War in the Pacific. The first book Pacific Crucible, covered 1941 and 1942 - Pearl Harbor to Midway, plus the prelude to the war. This book covers the bulk of Pacific campaign after Midway, during which Japan's position deteriorated from their peak ascendancy, with America reeling, the Dutch East Indies under Japanese control, and Commonwealth nations from India to Australia threatened by invasion, to the dire straights the Japanese inevitably found themselves in only a couple of years later, with attrition and America's vastly superior industrial might combining with frankly stupid and outmoded attitudes among the Japanese high command to bring about a defeat that Admiral Yamamoto foresaw from the beginning. The Conquering Tide ends in 1944, leaving Toll's third volume to cover the end of the war, the planning for an invasion of Japan that never happened, the atomic bombs, and the aftermath. This is one of those big multi-volume epics that may be daunting to someone who's not a historian, but I encourage anyone with any interest in World War II, and the Pacific War in particular, to tackle Ian Toll's entire series, of which only the first two books are out yet and this is the second. The first book had me preordering the second as soon as I finished it, and now I eagerly await the third. Large as they are, these books don't read like dense historical textbooks. They are energetic and detailed accounts of the men who fought the war on both sides, with the most attention given to the commanders, of course, but also describing battles in detail, from eyewitness accounts and after-action reports, so the reader gets a grand view of the entire campaign, but also zooms in to the torpedo-bombing of individual ships, and the wartime lives of Americans and Japanese. The first book included a great deal of political background - what led Japan to its fateful (and catastrophic) decision to go to war with the U.S., and how the entire country went from rising modern nation to nationalist imperial power forswearing all the civilized principles they had previously subscribed to. Everyone knows, or should know, about Japanese atrocities committed during the war, a subject Toll refers to only in passing for the most part, but what was also mentioned in the first volume was that up until World War II, and during the Sino-Russian war in particular, the Japanese scrupulously adhered to international rules of war, and were known for treating their POWs with the utmost respect. So what happened? There's less about Anglo-American politics in this book, the relationship between FDR and Churchill being largely covered in the first, but as the situation on the Japanese homefront becomes more dire, Toll describes how it affected the Japanese population. By nature accustomed to trusting and obeying their leaders, the Japanese people nonetheless were neither stupid nor passive sheep, and while the military dictatorship strictly controlled the press and allowed only stories of glorious victories, then "strategic withdrawals," then "luring the enemy closer in order to destroy them once and for all" to be broadcast, the civilian population eventually realized that the war was not going well. (The authorities also couldn't cover up all the bodies coming home, and while returning sailors, soldiers, and airmen were expected to keep their mouths shut, word got out.) As Japanese propaganda became increasingly detached from reality, it only undermined trust, especially as deprivations became more severe and civilians were told to eat less and work more, even while it was common knowledge that the army ran the black market and high-ranking officers were still enjoying fine dining and geishas. But that's only part of the book - most of it is about military campaign, and while there is still plenty of ship-to-ship and air combat action, in '42 to '44 we enter the bloody island-hopping phase of the war, and American Marines and Japanese Imperial soldiers die by the thousands on tiny atolls none of them could name or locate on a map. Their living conditions are terrible, the climate and native flora and fauna makes life miserable, and the fighting is horrific. You can also see here the seeds of the eventual decision to use atomic bombs on Japan being planted. This is a debate that will probably never be settled (though I look forward to how Toll addresses it in the third book), but one of the primary justifications of the use of atomic weapons is the purported belief that Japan would never have surrendered otherwise, and that an invasion would have been even more horrifically costly, to both sides. After reading accounts of how Japanese soldiers threw themselves at the Americans in suicidal "Banzai" charges, how over and over again they chose to die rather than surrender (Japanese sailors whose ships had sunk would typically refuse rescue from American ships), how they had to be dug out of caves and bunkers the hard way, with bombs and flamethrowers, how they would booby-trap bodies or even call to American medics and then pull the pin on a grenade, and how even Japanese civilians threw themselves off cliffs after the battle of Saipan, mothers holding onto their babies, and were praised for their dedication and patriotism - it is easy to see how the U.S. came to that conclusion. Japan never had a chance of winning the war - its fate was sealed on the morning of December 7, 1941. But one can imagine, in an alternate history, how they might have had a chance to end the war differently, perhaps with the negotiated peace that was their original plan. This volume and the one preceding it traces how and when things went wrong for Japan, leading to their inevitable utter capitulation. Several key battles, had they gone slightly differently, had luck favored one side a little more, or had commanders not made a few understandable errors, would have significantly altered the course of the war, at least in the short term. Japan was always fighting an enemy that simply had the power to replace ships and planes and men at a rate far greater than they could ever match, with American's production growing and her military technology ever improving even as Japan's resources dwindled, but with better intelligence, and better decisions, and better use of their forces, Japan would have been an even more difficult adversary to defeat than they were. The fighting spirit of the Japanese soldier was impressive, but over the course of the war they went from being despised, untrained savages held in contempt, in the beginning, to feared jungle ninjas with supernatural powers, until eventually the Americans realized they were just men, like themselves, capable of great bravery and fortitude but also capable of being demoralized, starved, and exhausted. In the end, it was the Japanese high command that did in the IJN and the IJA - with bad decision after bad decision (starting with attacking the U.S. in the first place, of course), like maintaining a cumbersome inter-service separation, and refusing to rotate their best pilots away from the front to let them recover, and telling overworked and underfed civilians to do calisthenics to keep up their spirits. All of this is detailed in this book. There is no portrayal of Japan as monolithically evil or the U.S. as unambiguously the "good guys," just an account of what set these powers against each other and how they went at it. The Conquering Tide is Mr Toll’s second volume in his trilogy of the World War II Naval War in the Pacific. 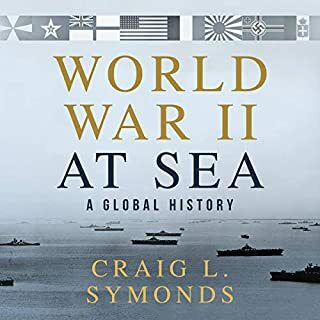 It is important to note that this book only covers the naval war involving those forces serving under Admirals Earnest J King and Chester Nimitz (and, of course, their Japanese equivalents) and largely does not cover the second thrust under General MacArthur in the South West Pacific Area. Mr Toll’s book covers the period from immediately after the Battle of Midway through the Battle of the Marianas and, like his first book, is extensive in its coverage and very thorough in its presentation. 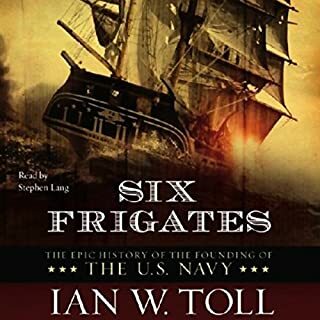 He has clearly done an enormous amount of research and the story takes us from the counsels of the Admirals and Generals on both sides through the actual battles and at most times is riveting and hard to put down. Every major and minor battle seems to be covered (within the sphere of the naval war) and there is a great deal of explanation as to why some things happened and others did not. The major background story is the transition of the American Forces from barely adequate and largely lucky at the Battle of Midway to their high proficiency in 1943 and 1944 and their subsequent dominance in the naval war. One of the things that has made Mr Toll’s books so interesting for me is that his books not only cover the battles of the war but also spend a great deal of time explaining the effects of the war on those who are not direct combatants and covering the social and political events that form the background for the war. Thus, in addition to the actual fighting, we learn about the effort to right and repair those ships damaged during the Japanese attack at Pearl Harbor, about the failures of the US torpedoes during 1942 and early 1943, what those problems were and the effort to find and the fix them, a study of the effectiveness of the US blockade around Japan and the effects of the submarine sinking of cargo ships bound for Japan, the effects of the war on the Japanese effort to replace and train their naval pilots, how the newer models of the US naval aircraft fared against the Japanese upgrades of their Zero fighters, what life was like during the war in Australia, Washington DC, Honolulu and in Japan and much, much more. All of this background material was interesting and some information was completely new to me as, for example, how the US was involved in running quasi-legal brothels in Honolulu for sailors and soldiers on liberty when their ships returned to Hawaii. There are some things I thought were missing from the book. 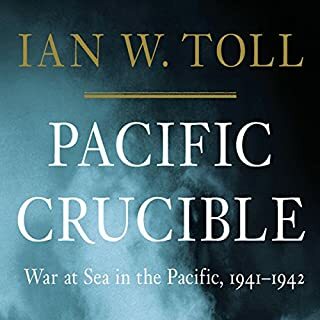 Mr Toll’s first book in this series, Pacific Crucible, described the private thoughts of many of the Japanese sailors, taken from their diaries and interviews, about the initial Japanese successes during 1941 and 1942 up to the Battle of Midway. I thought it would have been interesting to hear how normal Japanese felt as the US began taking back those island strongholds, but there is little of that in the book. Further, since the book covers the naval war, there is very little of General MacArthur’s parallel effort to seize and hold New Guinea strongpoints on his way back to the Philippines with the only mentions of that action being when it touched upon the naval war itself. Still, as an analysis of the naval war, it is simply superb, extremely well written, fascinating, informative and gripping. I have only one major complaint about this book. The first book in the series is narrated by the incomparable Grover Gardner whose voice, pitch and diction are perfect for this kind of book. 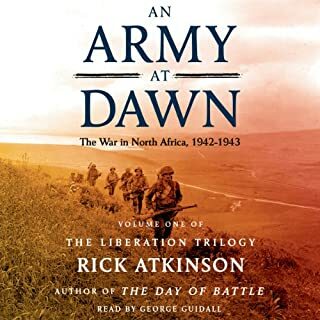 I consider Mr Gardner to be perhaps the best narrator available for histories like this and his replacement by Mr Orchlan for the second book was a big disappointment. While Mr Orchlan does an completely adequate job in narrating, his reading is largely uninspired, contains unfortunate mispronunciations and suffers greatly in comparison to Mr Gardner. Regardless, I highly recommend this book for anyone who is interested in the World War II Pacific naval war. If you are like me you are going to need a map. What disappointed you about The Conquering Tide? Having read Volume 1 I was looking forward to Volume 2 but its very tedious, lots of repetition, and way too much needless detail. I think vols 1 and 2 could have been edited into 1. I could not finish some chapters. This is an excellent book that presented a cogent history of these important events. The work was well presented and the historical flow of events was clear, even as the author switched geographic location. The insipid narration. The worst I've ever encountered. What other book might you compare The Conquering Tide to and why? Boring. Hesitating. Monotone. Uninspiring. The worst narration I've encountered. What character would you cut from The Conquering Tide? Audible needs to bring back the ability to gift books. I recommend people get audio books from the library or torrents until this feature is returned because it's insanely stupid. Learned a lot about Navel warfare in the WWII Pacific Theater. Highly recommend this audio book. Very detailed and well researched. For the book and the author's take on the subject. Disappointed in the narrator. A trend with many of the military history audible books I have noticed is narrators who have difficulty pronouncing military terms as well as creative and annoying ways of pronouncing names and places. 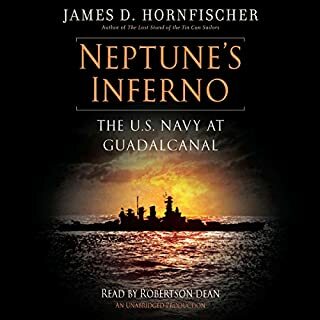 I would hope that audible or who ever would place an emphasis on making sure the narrators have a handle on military terms and the geography they are reading. Very frustrating to hear the same term or place mispronounced time and time again. Would you listen to another book narrated by P. J. Ochlan?